Swim, snorkel, and sightsee on a day-long cruise from Podstrana to the southern Dalmatian islands. Loved for their secluded bays and turquoise waters, the islands are also home to grottoes that glow with colorful, yet natural, light. Visit the legendary blue and green caves of Biševo and Vis, then enjoy free time to explore the Palenki islands, Hvar, and Budikovac. Meet at Le Méridien hotel in Podstrana in the morning, and make your way to the port with your guide. Board your boat, and relax on the cruise to the island of Biševo. Here, you’ll enjoy a visit to the famous blue Biševo Cave, illuminated with an ethereal blue light. Explore the cave with a local guide, then return to your boat to cruise to Vis island. 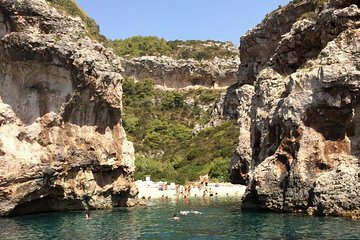 Cool down with a dip in the clear waters around Stiniva Cove, before you head to the island’s green cave, another of the region’s naturally lit grottoes. Cruise onward to Budikovac island, then the Palenki islands, enjoying swimming and snorkeling stops at both places. At the Palenki islands, you’ll dock at Palmižana or a similarly scenic bay, and have free time for lunch and sightseeing (own expense). In the afternoon, cruise to Hvar Island. Spend your last stop of day splashing in the waters as the afternoon sun beats down on you, and take a stroll around to see Hvar’s sights. Return to your boat at the prearranged time, and finish with a cruise back to the start point. You’ll arrive at the mainland port in the evening.